If you haven’t heard, Comedians in Cars Getting Coffee is an amazing web series. The talk show – created, hosted and directed by Jerry Seinfeld – is all the rage, and it spans across nine web seasons via the digital network, Crackle. It’s on Netflix too, introducing different vintage cars to different guest comedians. What’s Comedians in Cars Getting Coffee All About? The show picks guest comedians to take a spin around down. A restaurant or café is picked, and the comedian goes out for coffee. This isn’t to say every ride is planned, predictable or even formulaic. Every episode diverts from the main course, giving us a spontaneous trip. While every visit is unique—and while each gives viewers something exciting to look forward to—we believe a couple episodes stand out above the rest. That’s right: Obama was a guest star. 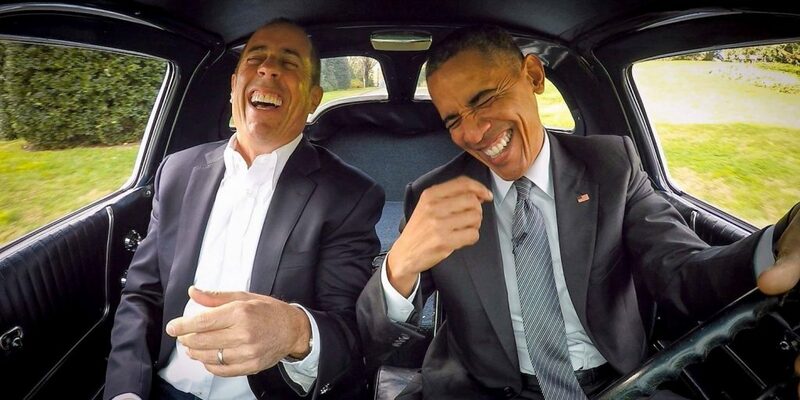 Obama and Seinfeld shared an episode together on the White House South Lawn. Soon after, a coffee break ensued. This time around, the vehicle was a silver-blue 1963 Corvette Stingray Split Window Coupe. They had coffee inside a staff dining room in the White House’s basement, and Seinfeld asked Obama about a day in the life as the President of the United States. The show’s runner, himself, got an episode. Well-known across the world as a beloved comic voice and TV innovator, Seinfeld got to dish out some of his own material during a ride. The Netflix release also included two new Seinfeld stand-up specials. While Comedians in Cars Getting Coffee wasn’t tied directly to it, we felt the pairing was a snug one. Along with Cedric the Entertainer, Lewis Black, Bob Einstein and Kristin Wiig, Norm Macdonald was a Season 9 appearance well-worth the watch. Offering one of the show’s best roundups of Jerry Seinfeld’s comedic banter, the Norm Macdonald episode is one of the top items to see. Season 9 itself is a bit more unique for its off-road adventures, paddle boat trip and Bob Einstein’s return. With some great new guests packed in to party, any episode following the Norm Macdonald release is worthy of a watch. The interview-style rides are tight, and each episode features echoes of Seinfeld’s old standup acts while also introducing new scenery. Sure, it might be a show centered on cul-de-sacs, diners and other comedians, but Comedians in Cars Getting Coffee is one of the coolest online shows around. If you haven’t yet, give it a watch! It might be your new favorite thing. Love it as much as we do? You can watch more, including full episodes, of Comedians in Cars Getting Coffee for free here (Link has since been removed by host). Are These The Best Car Commercials of All Time?